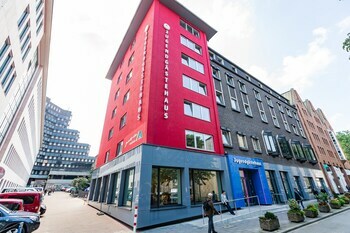 A stay at DJH Jugendgästehaus Adolph Kolping - Hostel places you in the heart of Dortmund, steps from Hansaplatz and Thier-Galerie. Featured amenities include complimentary newspapers in the lobby, a 24-hour front desk, and luggage storage. This hostel has 7 meeting rooms available for events. Limited parking is available onsite. Located in Wolgast, Postel Wolgast is a 4-minute drive from Usedom and 9 minutes from Welt Steht Kopf. The front desk is staffed during limited hours. Free self parking is available onsite. With a stay at Hotel Am Wehrhahn, you'll be centrally located in Duesseldorf, within a 10-minute drive of Museum Kunstpalast and Duesseldorf City Hall. With a stay at Park-Hotel Norderstedt in Norderstedt, you'll be a 5-minute walk from Tribuhne Norderstedt and 11 minutes by foot from Stadtmuseum Norderstedt. Free self parking is available onsite.